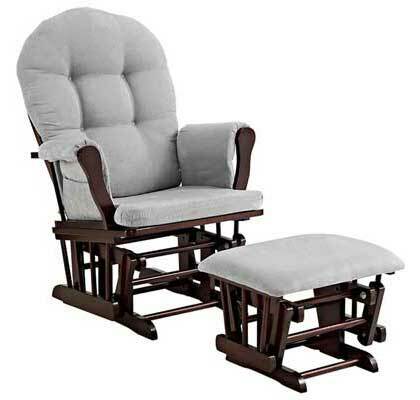 A cross between rocking chairs and gliders, glider rockers are handy seats that swing back and forth. Mothers with newborn babies often use these chairs in their nurseries. 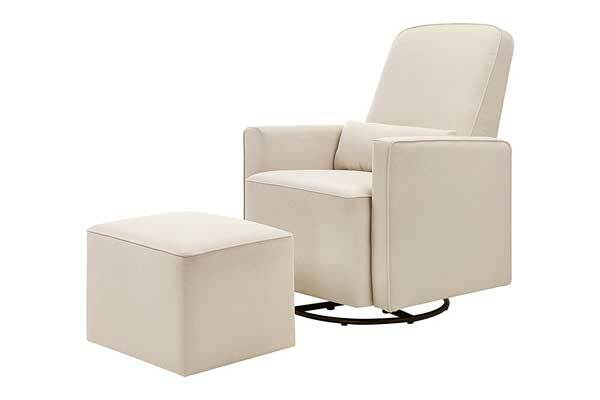 After all, glider rockers offer an ideal place to cuddle, feed or read to a child. Infants find the swinging motion of these chairs soothing and sleep inducing. 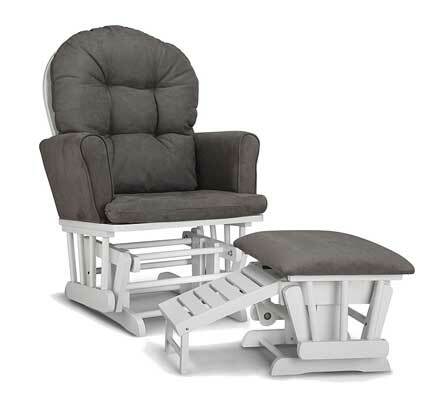 However, anyone can use glider rockers at home, especially when in need of a comfortable seat to wind back and relax. In most cases, rocking gliders come with an ottoman footstool. Since these chairs slide on a fixed track, little effort is required to produce the rocking motion. In comparison, it can be very hard to get any momentum going on a rocking chair with both feet propped up. In addition, unlike traditional rocking chairs that rely on skids to move up and down, glider rockers feature an enclosed ball bearing system that rocks the seat. This makes them safe to use, since crawling toddlers won’t risk having their fingers crushed under the arc-style feet found on rocking chairs. Gliding rockers come in a variety of styles and sizes. These seats are available in a wide range of prices but keep in mind that glider rockers are not created equal. Designs that are more expensive often feature hardwood and/or steel frames upholstered with soft, durable fabrics. To select a good quality chair, a few other factors come into play as well. For starters, gliding rocking chairs offer varying levels of comfort. The coziest seats tend to have plenty of cushioning for the arms, seat and back support. Some models even have a reclining back and headrest. Reclining rocking chairs built on a swivel base can take comfort to a whole new level. Such rocking seats rotate 360-degrees, thus eliminating the need to turn your body when trying to look back. Your glider rocker will be one of the most used pieces of furniture in the room, so it make sense to purchase one that has a sturdy frame. Other important features to look for include easy-to-clean fabric and a locking mechanism to keep the chair from moving. There are endless choices when it comes to glider rockers. Looking at what various brands offer can seem overwhelming. A good strategy for simplifying everything is focusing on glider seats from reputable brands. With that in mind, here are some of the best glider rocker reviews to help you choose trusted brands. The Stork Craft Custom Hoop Glider brings comfort to any living space. This generously sized chair offers padding for the high backrest, seat and arm cushions. The beauty about its smooth ball bearing gliding motion is that the seat rocks in tandem with the provided ottoman footstool. On either side of each arm, there are large pockets for keeping baby toys, supplies or other accessories within easy reach. 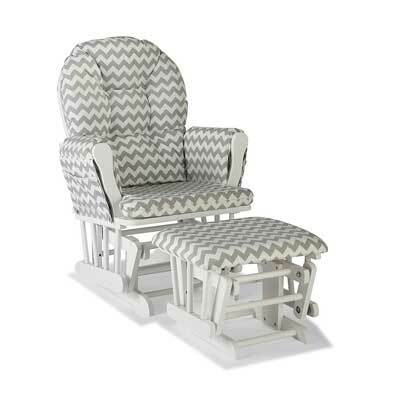 This Stork Craft glider and ottoman combo comes in a variety of wood colors for the base. Buyers can customize it further by selecting spot cleanable cushions with chevron patterns or different solid shades. The only downside is that no locking mechanism is provided. The Angle Line gliders and ottoman sets offer a wide range of wood finishes and cushion colors. This particular model is made of 100% polyester removable gray cushions and white painted wood. Pockets on the sides provide convenient storage for baby bottles, the TV remote or even your mobile phone. Comfort is guaranteed thanks to the high back support with headrest and decent padding. As with the previous model, this glider rocker offers no lock system to prevent it from moving. On the plus side, the included ottoman offers footrest for mothers when breastfeeding. The Baby Relax Mikayla swivel gliding recliner chair is unlike most nursery gliders on the market, both in functionality and design. This seat rocks back and forth like any other glider. In addition, it can rotate 360-degrees. As such, nursing moms can change directions without having to move the entire chair. At the push of a button, the backrest also reclines backward. You can pull up the footrest as well for incredible comfort. What’s more, the supportive spring core filled seat offers cozy padding and soft micro-fiber upholstery. This chair is very heavy, so users can expect a sturdy seat. Its only cons are the lack of a locking mechanism and storage pockets. This rocker glider from DaVinci Olive resembles a traditional club chair. It will look great with other living room furniture. Guests might not even know that it is a glider rocker with its smooth backrest and polyester fabric with a contrasting piping design. What makes this glider special is the swivel function it offers. Unlike other seats that come with a multitude of tie on pillows, this glider rocker only features one separate leg rest and lumbar pillow for lower back support. Its metal frame supports the thickly padded polyester upholstery while a high back design gives ample neck support to users. The Garco Parker semi-upholstered glider with bonus ottoman offers a comfortable way to wind down and put your feet up after a long day at work. Mom or dad can rest comfortable while feeding baby, watching TV or reading a book. The pullout nursing-stool makes breastfeeding comfortable, since it offers lower foot support than the ottoman. The stool slides back into the ottoman when not in use. Garco Parker uses plush microfiber fabric for this glider and ottoman set. To ensure safety for all users, the fabric is BPA, latex, lead and phthalate free. Keep in mind though that locking the gliding motion is not possible plus this seat features no storage pockets. The Baby Relax glider and ottoman combo offers a comfortable seat with gentle rocking motion for mother and child. This chair is extremely comfortable because it is heavily padded. The high backrest does not recline, but it provides ample neck support. The chair also adds a class of elegance to your décor with its tufted backrest, Espresso wood finish and dark chocolate soft microfiber fabric. No locking mechanism is provided to stop the gliding motion. 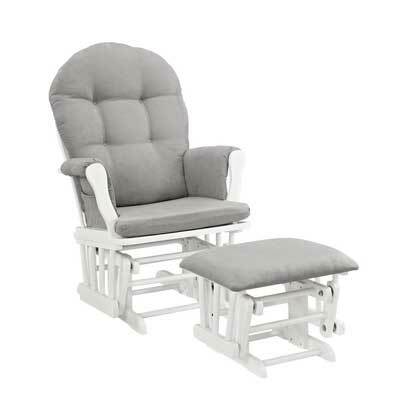 However, this glider rocker still offers good value for the price considering the level of comfort that buyers get. Relax in reclining comfort with the Pulaski Harmony glider chair. This rocking glider features a backrest that is fully adjustable, allowing you to lean back while rocking baby to sleep. You can even pop open the hinged footrest attached to the seat. With the swivel base that spins the chair 360-degress, there is also plenty of room for movement when using this glider rocker. The arms, back and seat are generously cushioned to offer ultimate comfort. The Pulaski Harmony glider with hardwood frame would make a great living room armchair with its unique design elements. Its detailed piping and trendy Moroccan quatrefoil pattern would certainly add to your interior décor. Get cozy in style with this Angel Line Windsor glider chair, which comes with a matching ottoman in Espresso wood finish. The quality and durability are outstanding as expected from Angel Line gliders. This particular model offers smooth gliding motion, easy to clean polyester fabric and a high backrest. Its arms, seat and back support are generously padded. In addition, pockets sewed onto the arms provide convenient storage space within arm’s reach. 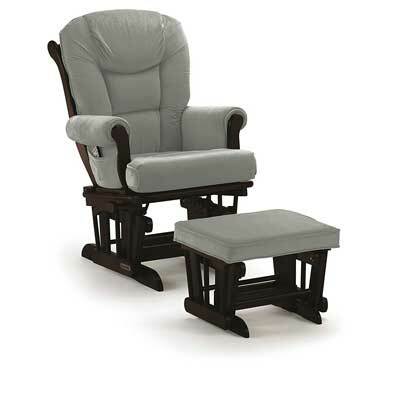 The Shermag glider rocker is ideal for nursing or simply relaxing. It comes with a matching ottoman for propping up your feet after a long and tiring day. The glider’s backrest does not recline or swivel, but it locks in multiple positions. 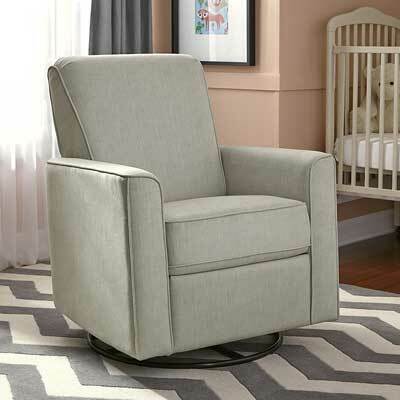 This glider rocker from Shermag lets users relax or snuggle with baby in plush, suede-textured fabric. Heavily padded armrests feature pockets on each side, providing easy to reach spaces for storing baby items or frequently used accessories. Crafted from a solid hardwood frame, this Shermag rocking glider is very sturdy. Rocking on it is easy since the enclosed steel ball bearing system allows for an easy gliding motion. 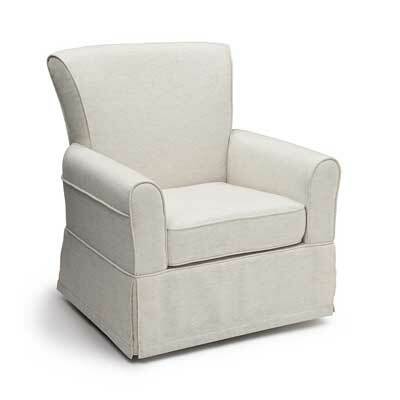 The Delta Children upholstered glider is a plush rocking armchair designed to offer quality time for parents and their infants. With its supportive back, wide seat and gentle swivel plus gliding motion, both parent and child will love this glider rocker. Thickly padded armrests, back support and seat provide great comfort to users. The seat cushion can come off for cleaning. It is also very easy to spot clean the poly-linen fabric material that covers this glider rocker. Reaching a buying decision should be easier if you took the time to go through the best glider rocker reviews provided in this post. However, remember that there are many preferences to take into account when looking for the perfect rocking glider seat. 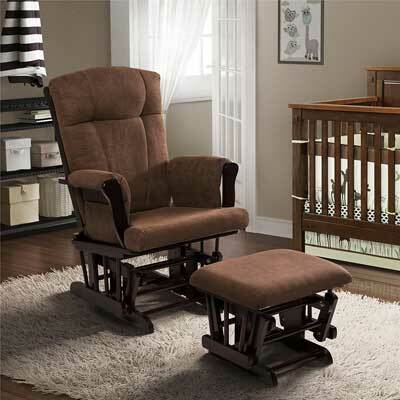 For instance, mothers who want a nursery glider should go for one that offers the best comfort. The Graco Parker Semi-Upholstered Glider offers great comfort to breastfeeding moms due to its convenient pullout stool. Alternatively, the Shermag Grey Espresso Glider is a great piece of furniture for baby nurseries because of its locking mechanism. This makes it easy to get up with a baby in your arms while at the same time providing a safer environment if you have other toddlers crawling about in the house. When it comes to selecting glider rockers for relaxation, you will want to go for a seat that complements your home furniture. The DaVinci Olive Upholstered Swivel Glider and other similar seats can easily achieve this effect with their armchair-style design. Space requirements should also be factored into your buying decision. Some glider seats take are perfect for situations where there is limited space in your nursery or living room. 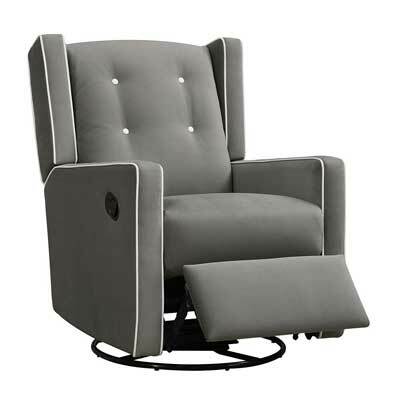 When you don’t have space to accommodate an ottoman, consider going for options like the Baby Relax Mikayla Swivel Gliding Recliner or Pulaski Harmony Swivel Glider, which feature pop-up foot rests that can easily be tucked into the seat when not needed. Whatever your preferences are in a glider rocker, take the time to evaluate your options.